I have already begun to process the lasting impression this trip has had on me, and I am sure I will continue to process for a long time after I get home. As of right now, I know this trip has changed how I think about myself as a teacher, has deepened my love for service, and has ignited a desire to travel. The students and staff at Assumption, the staff at the Outpost, the children at the orphanage, and people we have met along our weekend adventures have all helped me consider these points. To begin, I believe this trip has had a lasting impression on how I think about myself as a teacher. I always knew that teaching would be hard, but this experience showed me just how hard. Teaching takes a ton of planning, this trip has showed me that sometimes no matter how much you plan a lesson it may not be effective for your students. It is important to be adaptive and change a lesson to meet students needs. I learned that providing extra help during tea time was one way to help students after a lesson did not go as planned. This trip has also helped me to become more confident in my abilities as a teacher. I have only co-taught one lesson in Columbia, so I think being thrown into a leading a classroom by myself was exactly what I needed. Teaching several lessons has helped me become more confident in my abilities. Teaching here showed me I could be creative and effective with no materials. I was able to teach math without manipulatives and a SMARTboard! In addition, my time in Tanzania has deepened my love for service. Ever since I was little, I have always been working on service projects. In high school I was a member of Service over Self and have continued volunteering in college with a service sorority. This trip has deepened my love for service. Visiting the orphanage as well as interacting with the students and staff at Assumption has helped me consider how much I love serving others. I have been very fortunate, and enjoy being able to help others whether it be with my time or other services. On our way back from safari, we saw many hungry Maasai children. It was the first time I saw hunger. I know that when I return to Columbia, I want to volunteer with the Food Bank and other organizations that work to fight hunger. Finally, I know this trip has left a last impression in terms of igniting my desire to travel. 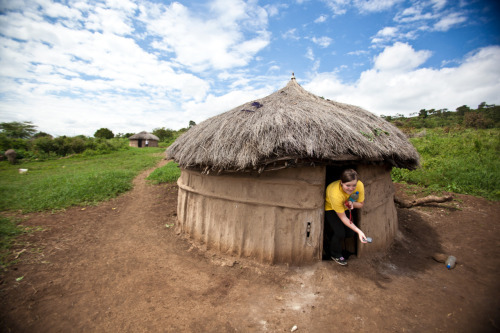 Our weekend cultural trips have left me with a desire to learn more about the people of Tanzania. I want to learn more about their language, traditions, values, and much more. I hope to one day be able to return to Tanzania to learn more. I also want to travel to other countries and learn about different cultures. I think traveling can help me to become a more culturally competent educator. ~ by kweber394 on May 23, 2012.